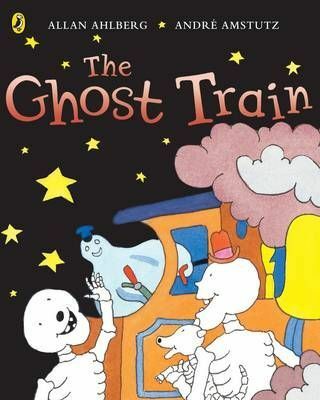 "The Ghost Train" is one of the titles in Allan Ahlberg's iconic children's picture book series about skeletons, "Funnybones". Despite being set in a dark dark house, this brightly coloured book is perfect for early readers! "Whoo-ooo-ooo!" It's midnight at the station and the three skeletons climb aboard the ghost train for a spooky ride. But they discover something even more scary! "By far our best writer for the young". ("Daily Telegraph"). Allan Ahlberg has published over 100 children's books and with his late wife Janet, created many award-winning children's picture books, including "Peepo! ", "Each Peach Pear Plum" and the Kate Greenaway Medal winning "The Jolly Postman". Other titles in the "Funnybones" series include "Funnybones", "Mystery Tour", "The Black Cat", "The Pet Shop", "Bumps in the Night", "Dinosaur Dreams", "Skeleton Crew", "Give the Dog a Bone" and "A Brilliant Bone Rattling Collection", all of which are available from Puffin.